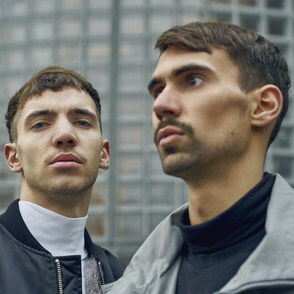 FJAAK is an electronic music trio from Berlin. Having grown up together, they began to create all types of music made with microphones, guitars and drums in a dark, chaotic and dirty cellar at quite an early age. After getting in touch with the Berlin underground techno scene, days and nights started being all about music. Whether it was chopping beats on the MPC in the morning hours or studying manuals, the internet, vinyl stores and Schneiders Buero. Starting to gain worldwide attention in 2009 with an alternative and boundary-pushing take on classic techno, house and breakbeat they have meanwhile started their own party series based on all hardware setups and vinyl only – machine vibes. Starting off with open-air events in Berlin, machine vibes now takes place in carefully selected venues around Europe. In 2014 they signed to 50Weapons and have since released two captivating and very fresh sounding techno EPs. Modeselektor have hot tipped them to be the next big thing. We cannot wait to hear more.